Apply to clean, towel-dried hair. Leave-in. Style as usual. 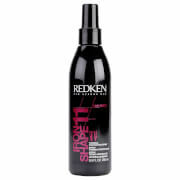 Humidity-Resist Complex Exclusive technology developed in Brazil to control all levels of frizz. I've just started using this spray out in the US. My hair loves to do its own thing. This is the first spray I've found that keeps my hair smooth between washes whatever the weather is doing. Love it and have already ordered move. Before radiotherapy I had normally curly healthy hair, since then I have had frizzy hair that I had almost given up on controlling, I use Frizz Dismiss Smooth Force Lotion Spray in between washes when my hair has got damp, before restyling in the morning I give t a quick couple of squirts and it smooth and shiny again. I use the cream leave-in treatment after washing as my main way of coping with my new found frizz. This spray promises much, but the effects seem to be almost imperceptibly subtle. I have thick, curly and frizzy hair, and it hasn't lived up to the promises it makes for "sleek, silky soft locks". Didnt expect to have added more shine to hair but at least not to make them sticky and so dull that have to go and wash again. Tried few times, still the same result. Very disapointed. Waste of money and time. Better to spend a bit more and get better product! 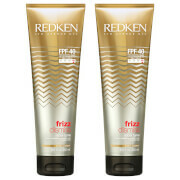 Once more Redken have made me a very happy bunny, I have very course, dry, frizzy hair and this is wonderful, I use it before I style my hair and it actually leaves me with wonderful curls and not a haystack. Thank you so much.